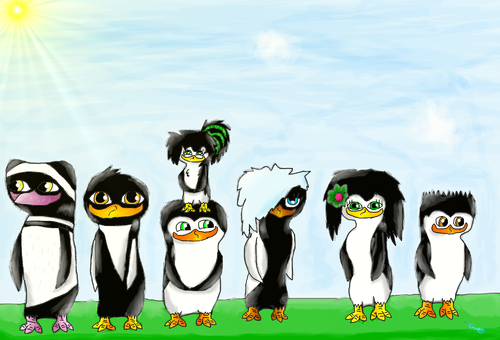 My other peguin Ocs. :P. So these are the last of my Ocs. :P At the top, there's Willow, and on the bottom, left to right there's Tyler, Eric, Ashely, Tessa, Evie, and Tom. 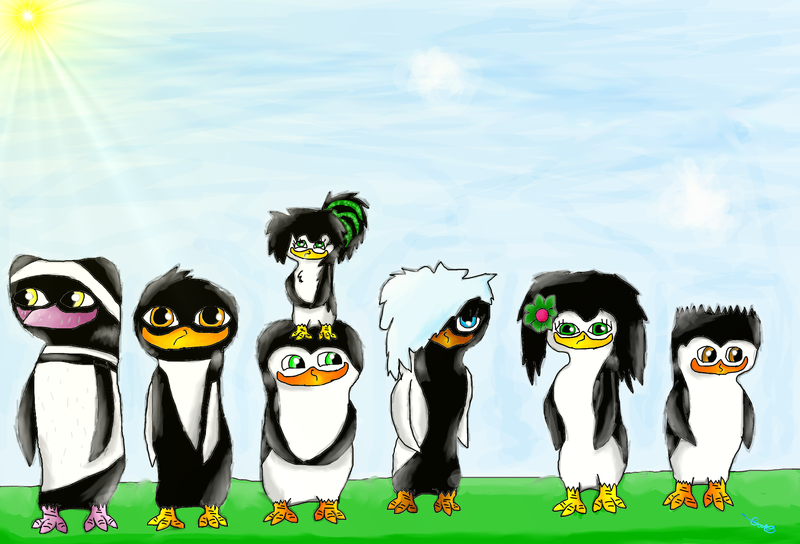 HD Wallpaper and background images in the Fans of PoM club tagged: oc penguin emma willow tyler eric ashley tessa evie tom. Then there's Evie. :P She was the second Oc I ever created, and when I fist made he she didn't have any hair feathers, she was more Pom realistic. :P Anyway, she is really cheerful, and sweet. :3 She was born in Texas, and was Private's golf manager when he was Mr Tux, and he was the only one who knew his real name. They dated for a while, but they had to break up when he left. And last is Tom, my real life little brother who's been a right pain in the neck today. -___- Even though this is him as a penguin, it's still my Oc because I created it. :P Anyway he's sporty, kinda funny and extremely annoying. But he's still my brother. :3 (He also likes Pom btw, but not as much as me) He likes to play outside, or go on the PS3. Aw! Willow is so cute! :3 Nice pic. Little Em!!! :D Willow is so adorable!